(U//FOUO) Acts of violence perpetrated against healthcare providers and emergency responders, by patients with behavioral and mental health issues, have been occurring for many years. Recently, there appears to be a significant increase in these events and they are occurring with a higher degree of violence. Not only are these acts of violence occurring throughout Central Florida, but are increasing across the country as well. (U//FOUO) ORANGE COUNTY (FL) Region 5 – In April of 2013, a man wearing a white lab coat portraying to be a healthcare provider, approached a pediatric patient’s father in the hospital parking garage as he was changing a flat tire on his vehicle. He asked the father why he was at the hospital, and the father told him everything about his child, including the child’s name. The man told the father that he was a doctor and could help his child. The imposter entered the hospital and attempted to go to the child’s room. He was stopped by front desk personnel and refused access due to his suspicious nature. When approached by security personnel he became confrontational and left the hospital taking off his shirt, running down the railroad tracks located adjacent to the hospital. Law enforcement was contacted concerning the incident. Later, the same man was almost hit by a security vehicle when he ran in front of it. He started hitting the hood of the vehicle and screaming at the security officer before running off again. He left before law enforcement could trespass him. It was later discovered that the man was recently discharged from the mental health unit at that hospital. Analyst Comment: Although this incident did not turn violent it displayed aberrant behavior that could have lead to injury to an in-patient, clerical personnel, healthcare provider or security staff. This person’s behavior was unpredictable, intrusive, and could have turned violent if not handled appropriately. When the front desk staff recognized that something was not right they immediately called for security personnel to assist. This action effectively de-escalated the situation. (U//FOUO) ORANGE, OSCEOLA & SEMINOLE COUNTIES (FL) Region 5 – Throughout 2011-2013, a man was routinely trespassed over eighty times and arrested due to an extensive history of deceptively seeking treatment for pain medication at hospitals and intake facilities throughout the region. The man’s motive was to self-admit or feign a mental illness. Once admitted, he would become aggressive, disruptive and often threaten to kill hospital staff and security officers if he did not receive medication. 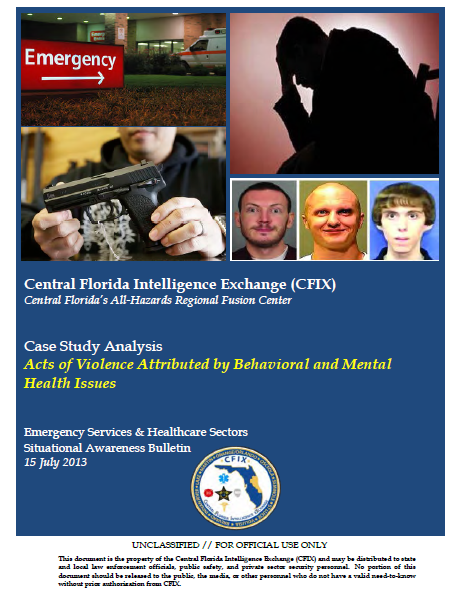 Analyst Comment: (Best Practice) A brief was developed by the CFIX (#12-2-84) on behalf of the Orange County Sheriff’s Office warning regional partners of the man’s threatening behavior. Local ambulance crews keep the brief readily available for distribution to law enforcement, in the event the man is transported by ambulance with similar intentions. Additionally, he has been arrested based on trespass violations and awareness provided by hospital security and ambulance crews generated from this brief. (U) ORANGE COUNTY (FL) Region 5 – In May of 2011 Dr. Dmitry Nikitin, a transplant physician who practiced at Florida Hospital in Orlando, was standing with several acquaintances on an upper floor of the hospital parking garage. This group was standing near the elevator conversing when suspect Nelson Flecha approached, pulled out a pistol, fired a shot, killing the physician. Flecha walked away and began to leave the garage. Once on the first floor Flecha turned the pistol on himself and committed suicide. It is unclear the motivation behind this killing but the patient reportedly demonstrated unusual behavior. The witnesses stated that they were completely surprised by the event as there was no demonstration of anger toward the physician prior to the shooting. Analyst Comment: This incident demonstrates the “unpredictability” of a person suffering from behavioral health issues. It is not uncommonly reported that a behavioral health patient will appear completely calm just prior to committing a violent act. The instability demonstrated by this person could have led to the deaths of multiple people in the garage. (U//FOUO) NORTHWEST (FL) – In May of 2013, a man became agitated after being denied a prescription for narcotics at a local health department clinic. The man became aggressive, and swung his cane towards clinic personnel, threatening to “return to prison if he has to”. Law enforcement was notified. (U//FOUO) SUMTER COUNTY (FL) – On May 17, 2013, an ambulance crew was dispatched to a residence for a patient with convulsions. Upon arrival the patient became combative and attacked an emergency medical technician and paramedic. While attempting to provide treatment, the paramedic was kicked in the face and stuck with a contaminated needle by the patient. The technician was also scratched and bit by the patient. Both the paramedic and technician were screened and treated for their injuries. Analyst Comment: In this incident the patient was restrained; however, managed to break free from those restraints. Actively violent patients should be properly restrained by physical means, medications (as a chemical restraint), or a combination of both if necessary. Such intervention is a best practice to prevent harm to patients, responders, healthcare providers, and others. This also provides a safer evaluation to determine the cause of the erratic behavior. Once the patient is restrained, close monitoring and constant observation should be conducted for the safety of personnel during transport and provision of medical treatment. (U) NORTHFIELD (VT) – On March 23, 2012, a 28 year-old man was seeking care of his mother in the emergency room and became agitated after being asked basic triage questions. He began with several verbal assaults and eventually grabbed a nurse by the hair and face and threw her to the ground. He was arrested and later ordered by the court to pay $13,000 to the nurse in restitution for her injuries. (U) BALTIMORE (MD) – On September 16, 2010, a distraught gunman critically injured a doctor at Johns Hopkins Hospital and later killed himself and his mother. The hospital was on lockdown for over two hours. (U) VALLEY STREAM (NY) – On September 11, 2010, a man broke a chair and used one of its legs to beat a 53-year-old nurse at a Valley Stream, New York hospital. That nurse required eye surgery after suffering wounds in the head, face and neck. (U) LAURINBURG (NC) – On February 19, 2010, a gunman opened fire in a trauma room at a Laurinburg, North Carolina hospital after a bar fight, shooting a patient and attempting to shoot the victims girlfriend. (U) COLUMBUS (GA) – On March 27, 2009, a man who was dissatisfied with his mother’s treatment at a Columbus, Georgia hospital killed a male nurse, a hospital administrative assistant and another hospital worker before being shot and wounded. (U) DANBURY (CT) – On March 2, 2009, an 85-year-old man shoots a nurse three times when she enters his room to provide treatment. The nurse then attempted to subdue the gunman when he also shot himself. The nurse was treated for non-life threatening wounds.